My Taiwanese friend Chris loves to cook seafood. 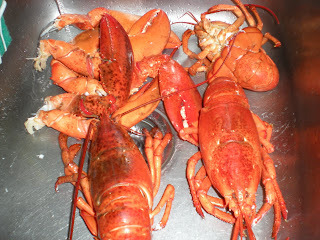 Some of our friends love to eat lobster so one of them bought two large lobsters so he can cook it. He found a great recipe from Chef at Home hosted by Michael Smith. 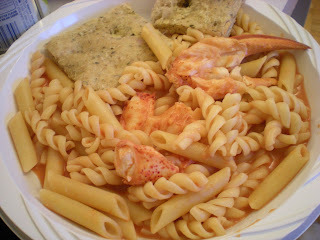 This pasta dish is served with a creamy lobster sauce reduced in white wine. You will have to use the whole wine bottle. 1. 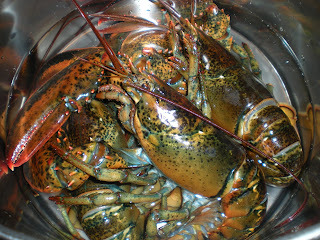 In a large soup pot, boil 4 cups of water over high heat, then add the lobsters. 2. Cover and let it steam for about 8 minutes per pound. 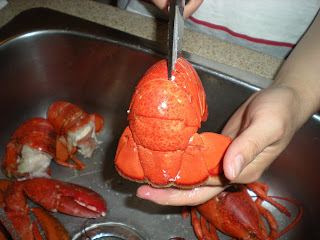 The lobster is cooked when the shell changes colour. 3. Use your powerful shears such as Cutco Super Shears to cut open the shells. Remove the meat from the tail, knuckles and claws and reserve. 4. Wrap shells in a kitchen towel. Smash shells with the back of a knife. 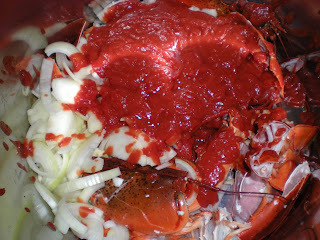 Put them in a large saucepot and add the cream, tomatoes, wine, onions, garlic and bay leaves. 5. 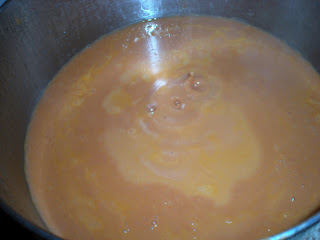 Simmer for 1 1/2 hours, until liquid reduces by half and the colour is reddish brown. 6. Meanwhile, cook pasta as instructed. 7. Strain sauce into a clean pot. Add salt and pepper to taste. Pour sauce onto pasta. This looks so delicious! Thanks for posting pictures of how you cooked and took apart the lobster. I can imagine how good the cream sauce with wine would be.